Michael Kernahan is one of the many pannists who have left Trinidad in search of musical opportunities, adventure and, ideally, some income. At first he toured North America with a steelband; later he settled in the United States on a permanent basis. However, he continues to maintain close ties with Trinidad and returns for visits on a regular basis. His many contributions to pan in the U.S. are based on his firm foundation and extensive education in the Trinidadian pan tradition. Kernahan was born in 1947 in Palo Seco, a small village in southern Trinidad. While a child, he moved to Manzanilla on the islandï¿½s eastern coast and, around 1960, ended up in the St. James neighborhood of Port of Spain (the capital of Trinidad and Tobago). Though he missed country life, his encounters with pan kept him tied to the city. During this period St. James was the home of many fine steelbands, including the famous Tripoli Steel Orchestra. Kernahan was fortunate to have cousins who were members of Tripoli, and he soon started playing with the band, in spite of his parentsï¿½ opposition. Even though pan was a widely appreciated form of music by this time, many Trinidadians still viewed panmen as disreputable and prone to violence and crime. "I started to play in Tripoli in 1964. My parents didnï¿½t know anything about that. I remember it was Carnival 1964. We were coming up the Tragarete Road, right by the Lapyrouse Cemetery [in the Woodbrook neighborhood of Port of Spain]. My mother was on the sidewalk. She saw me playing and she started to cry. She came in the band. Well, I had a cousin, he was an older guy. Luckily, my mother always believed in him. So he told her: "Well look, now, itï¿½s all right. Iï¿½m going to take care of him." Because she started crying and saying: "Oh lord, my son is a vagabond." You know, just now you start to walk with knife in your pocket. And she was really crying. I felt bad. But, when he talked to her and kind of calmed her down a little, it was all right. I continued playing until now. I never got in no trouble, and I never walked with a knife." During the mid-1960s Tripoli was in its heyday: it played on the streets for Carnival with legions of followers and at so many Carnival fetes (parties) that it often had to split into more than one section in order to fulfill all of its engagements. The band was also a regular competitor at the steelband festival that was held in the elite Queenï¿½s Hall at the time. Through their sponsor, the Esso oil company, over twenty members of the band, including Kernahan, were able to go on an overseas tour and play at Expo ï¿½67. Before arriving in Montreal, they played in several parts of the West Indies and in New York, with appearances in Lincoln Center and on the Ed Sullivan Show. Throughout the summer they performed at the fairï¿½s Trinidad and Tobago pavilion and were a phenomenal success. During this engagement they also recorded an albumï¿½The Esso Trinidad Steelband On Tourï¿½which included such tunes as "The Blue Danube," "Eine Kleine Nachtmusik," "Michelle," and "No Money, No Love," a calypso by the Mighty Sparrow. The musical form that is now known as "pan" emerged during the late 1930s in Trinidad. Its immediate precursor was African-Trinidadian tamboo bamboo music, which was played by striking different sized pieces of bamboo together or stamping them on the ground during pre-Lenten Carnival street processions. During the 1930s tamboo bamboo men began beating on metal containers (such as paint and trash cans), automobile parts and other metal objects. This metallic percussion proved to be louder and more durable than bamboo; around 1940 Carnival bands began to discard their bamboo altogether. During this period it was discovered that the bottoms of metal containers could be pounded into various shapes to produce musical tones when struck with sticks. Performance on different types of early pans was modeled on the roles of the diverse instruments of the tamboo bamboo band, though there was also influence from military marching bands, African-derived skin drums and, perhaps, East Indian-derived tassa drum ensembles. The earliest steelbands essentially provided a polyrhythmic background for the singing of Carnival revelers. The creators of pan were primarily young and from the "grass-roots" (low-income) sector of the society. Steelbands were based in various urban neighborhoods and villages, and intense rivalries ensued as panmen developed their new instruments. Following World War II, panmen often named their bands after movies, such as Casablanca, Destination Tokyo, Cross of Lorraine and Desperadoes. During Carnival the bands paraded the streets, often masquerading as sailors, and sometimes engaged in violent clashes. Panmen and their music were widely condemned by the middle and upper classes and even by many members of the working class. However, by the late 1940s there were some prominent civic leaders, artists and politicians who began promoting the steelband as an indigenous art form and arranged for bands to play in concert settings. Meanwhile, a steelband association was organized and middle-class youths began forming bands of their own. By the 1950s steelbands had become an integral part of the cultural life of the colony, performing everywhere from elite social clubs to nightclubs for sailors and tourists to weddings and christenings in grass-roots communities. When Trinidad and Tobago achieved its independence from Britain in 1962, the steelband was already an important national symbol. During the 1960s businesses began to sponsor steelbands and state support for the movement grew. 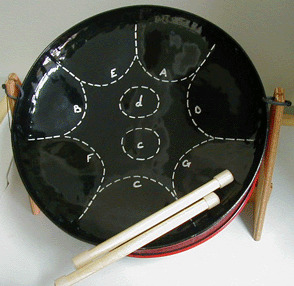 By the 1970s pan instruction was being offered in a number of schools, a development that encouraged women to join bands. The institutionalization of the steelband movement was paralleled by a transformation of the music. In the course of the 1940s more notes were added to pans by grooving additional sections on the bottoms of containers and, by the end of the decade, the full-size oil barrel had become the most popular source of instruments. Meanwhile, the tonal quality of pans improved and the wrapping of the ends of playing sticks with strips of rubber helped to create a mellower sound. By the early 1950s the different types of pans (each with its own register) contained sufficient notes to make conventional Western harmony possible. While steelbands played only simple melodies during the World War II period, by the early l950s they were performing a variety of local calypsos, Latin American musical genres (such as mambos, boleros and sambas), North American popular songs and European classical selections. Steelbands have continued to maintain eclectic repertoires up to the present. 1972 Returned to Trinidad started my apprenticeship with the legandary Pan Tuner Alan Gervais, myself and Harold Headley became Co-arranger for the band also I did some work with the CLICO employees steelband and was one of the main contributory to the return of "Pan Around the Neck:\"
1975 Returned to the United States with a eight member band and settled in Ann Arbor, Michigan, toured Colleges, Universities,Fairs, and many high profile performances through out the United States and Canada. 1978 The band changed its name to 21St Century Steel Band, Worked with the Wasntenaw Community College Jazz Band under the directorship of Dr. Morris Lawerence. Was instrumental with Director Mark Stone of Oakland University Auburn Hills Michigan in starting a Steel Band. The band took part in the 2004 Worlds Steel Band Festival in Trinidad and placed 8th.I have tuned and maintained said Pans. 1994 21st Century Steelband moved to Miami, Florida and worked with Dr. Dawn Batson's University of Miami Steel Band on several projects including the "Pan Into The 21st Century" symposium. 1996 Dawn Batson introduced me to Dr. Steve Stuempfle the Chief Curator of the Miami Historical Museum and writer of one of the best books written on the history of pan "The Steel Band Movement" a must read. The Florida Folk Arts "SONY BGM MUSIC" aquired a mechanical licence for one of my tunes "What is a Pan" to be sold in Colleges and Universities through out the United States. Thanks to Dr.Steve Stuemfle and Dr. Dawn Batson. Click HERE for a YouTube video with Michael discussing and demonstrating how pans are made.